There has been a lot attention given to the value of a traditional four-year college education. For the past thirty years or so, it has been thought of having three primary purposes: preparing students for a career, providing a social experience, and imparting civic-mindedness. However, with the rising cost of tuition and associated student indebtedness, the first two of these purposes are coming into question. There is a skills gap. Are there alternative ways to build relevant skills and knowledge – apprenticeships and online training? Are there less expensive ways to educate students – online courses, MOOCs, etc.? Are there better credentials than a college degree – online badges? The traditional education is not going away, however, colleges are going to find ways to address these issues – blend online and classroom learning, make internships more like apprenticeships, and shorten the path to a degree. There is sufficient evidence that many students are not learning much in college, even if they earn a degree. The bigger question is the value of a social experience. There is a transition from living at home under parental care and living independently. College shapes an individual’s social connectedness and sense of responsibility, but how much is this worth? Nevertheless, as the cost of college is put under a microscope, I think it is important to consider students who gravitate towards a party pathway. Tuition is based on a credit hour system (related to the number of hours a week students spend on courses). Professors are paid based on the courses they teach. But if students are not attending the courses, what are they taking out loans and/or asking their parents to pay for? Online learning helps some of these problems go away. Students can take a class or test when they are ready. There is no requirement to get up early in the morning or attend class on a Friday. Personalized learning and mastery is easier too. Students can get deeper into learning when they are ready. Still I am not sure there is an easy solution in dealing with the escalating college costs. 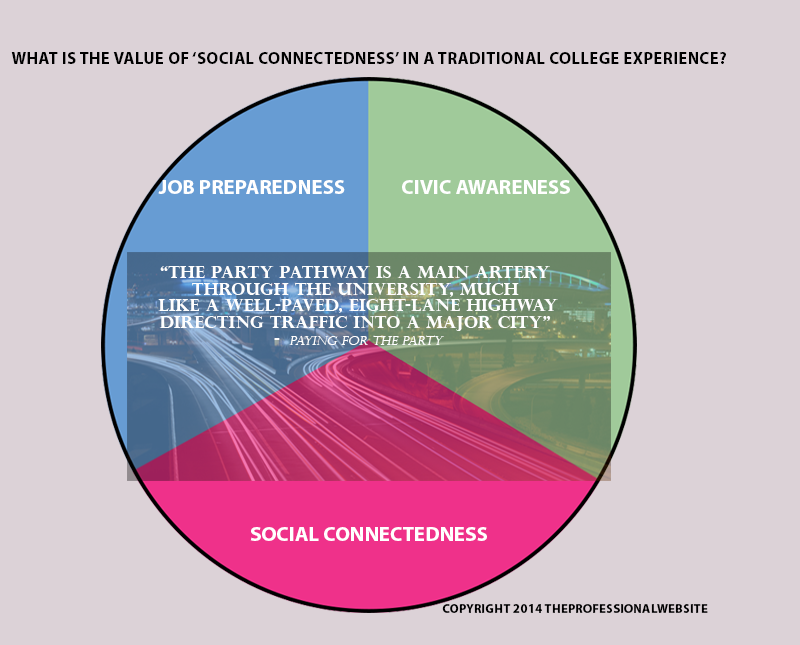 I think college students should understand their likely pathway and how it impacts their college experience. There has to be a better, less expensive way to go through a ‘maturation process’ to become academically prepared. Moreover, if you devote all of your time towards a ‘social experience’, then you should pay for a ‘social experience’ – not an academic education. Elizabeth A. Armstrong and Laura T. Hamilton. Paying for the Party. (Cambridge, Harvard University Press: 2013). The de facto college degree is getting squeezed from two directions: employers requiring professionals to build new-age technical skills (where there is currently a skills gap); and typical students who are faced with the rising cost of a traditional college degree and must take on significant debt. Moreover, according to a recent Gallup poll, a very strong majority of business leaders say hiring managers consider ‘knowledge’ and ‘applied skills’ as ‘very important in hiring decisions’ – 84 and 79 percent respectively. (This is far greater than the ‘degree’ or ‘college attended’ in the same category, only 28 and 9 percent respectively.) [i] And in another Gallup poll, business leaders were asked if higher education graduates have the skills ‘my business needs’ and 33 percent disagreed and 34 percent were neutral to the statement. [ii] More professionals have the opportunity to build skills and knowledge their own way, and there are three reasons why: access to knowledge, online learning channels, and social media. Online learning is going to revolutionize the whole process of becoming educated in a few ways. First, for many disciplines, you participate in self-guided learning. You take a free online course from a top-notch professor in any subject and this lays the groundwork to acquire deeper knowledge or simply provides enough context to work with others in the field. Second, with asynchronous learning, you fit online course requirements into a busy schedule (which might include working at a job); you usually have to complete about two to three hours each week (any time or day) for two months. Third, you spread the learning experience over a longer period of time. Traditionally speaking, you spend two to six consecutive years taking courses and then get a degree. However, considering how fast technical skills change, it might make more sense to take one or two courses throughout your career – spreading it out in a steady stream. I predict ‘continual learning’ becomes a requirement for most professions. With social media web services, it is possible to stay current with the most recent developments of a subject and interact with experts in the field. There are no barriers in following ‘thought leaders’ in Twitter, Google+, and LinkedIn. Many of them are willing to share their most current work for free; generally speaking, the only requirement is to spread the word (by liking them) and/or participating in the discussion. After some time, with enough active participation, you start to develop your own insights and build a reputation. In fact, most employers canvas the Twitter activity of potential candidates (and some claim to be willing to make their hiring decision solely based on it). [iii] Tyler Cowen. Average Is Over. Penguin Group (New York, 2013). iv Derek Bok. Higher Education in America. Princeton University Press (Princeton, 2013); page 93. 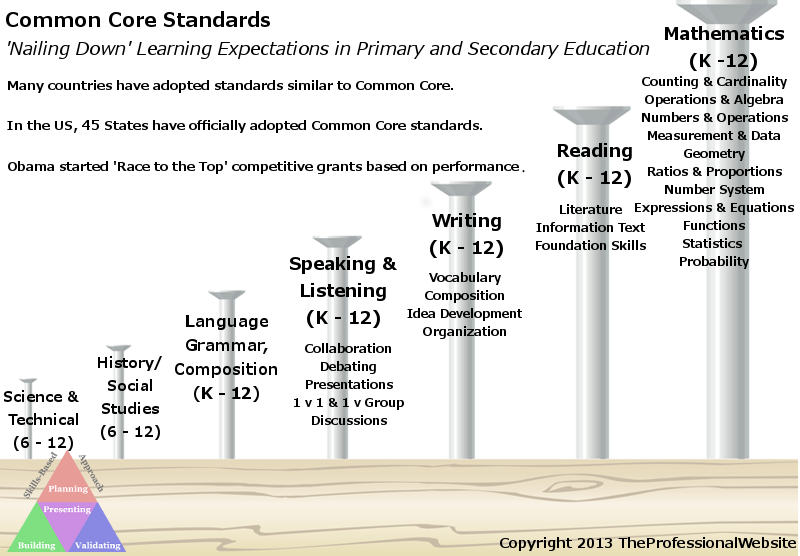 I think there are two ways to look at Common Core Standards Initiative. First, you have transparent and accessible standards available to the general public on a website. Adopting Common Core is compelling for this reason alone. It is powerful because parents, teachers, administrators and even students understand students’ learning expectations by grade and subject. In addition, third-party institutions are developing online courses and games designed on teaching particular standards. For example, SimCity created educational games teachers might utilize in the classroom or students play at home. Second, there are state standardized tests based on Common Core and this is what much of the negative attention is focused on. Testing is complex because it covers all primary and secondary education (K-12), and it is given to the entire demographic – public, private, and charter schools. Cleary there is room for improvement regarding the testing aspect of Common Core. In the letter, the principals say the test is too long and has ambiguous questions, and some children ‘react viscerally’ to taking the test. All of these problems are fixable by whoever is responsible for creating the standardized test; regardless, it does not translate to dropping Common Core standards. Schools should utilize an online version of the standard test so it is adaptive to students taking it, making it less harsh for the students who are overly challenged by it. Also in the letter is a point that the achievement gap is widening because of the standardize testing. Let’s motivate our children to perform based on their competency, not on their economic upbringing. Common Core is meant to challenge and engage our children to do better. That being said, there should be free, universally accepted resources (such as online courses and/or games) to support Common Core. All a student needs is access to a computer and the internet to supplement his or her learning in the classroom. I preface that I do not have children. I do not have experience consoling a child when they are visibly upset after taking a difficult test. I do not have experience trying to motivate a dejected child after he or she sees test results that they are under-performing among their peers. Without question, both of these situations require compassionate parenting. Common Core Standards Initiative should publish parenting advice which coincides with releasing test results to elementary age students. 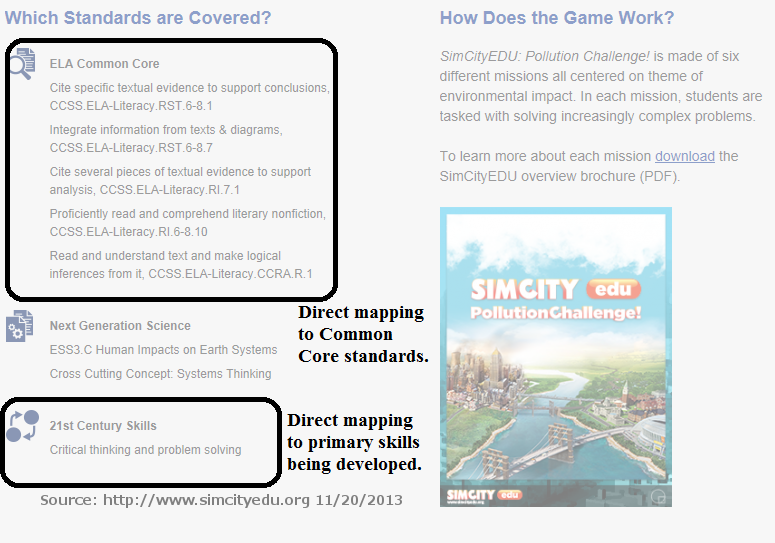 I mentioned earlier about SimCity offering games to build skills related to Common Core standards. On their website, they publish specific Common Core standards and primary skills being developed by playing their game (as shown in the graphic). Mapping what skills and knowledge you are building should become the norm for all online courses and educational games, and works great with a Skills-Based Approach – where you plan and build a skill set. [i] Valerie Strauss. “N.Y. school principals write letter of concern about Common Core tests.” The Washington Post, November 21, 2013. Common Core State Standards nail down precisely what primary and secondary education (K – 12) students are expected to learn in mathematics, reading, and writing. 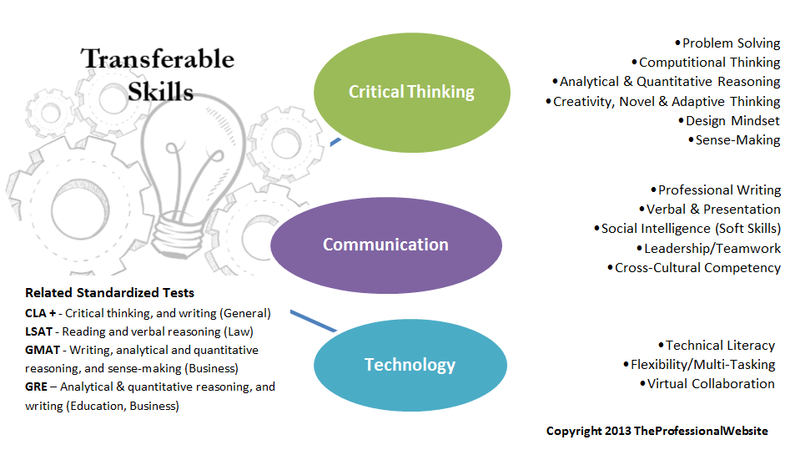 Learning related transferable skills is the primary objective of a K – 12 education because it is a foundation for higher education or training and eventually a career. On their website, Common Core State Standards Initiative publishes standards by subject and grade level; this is powerful because it makes teachers, tutors, students, and parents aware precisely what students are expected to learn. Teachers incorporate the standards into their lesson plans and parents and/or tutors provide supplemental learning to keep students on or above the standards. Like in many fields, the internet is transforming education by making information (Common Core standards) readily available to laymen (parents) so they make better decisions. There are a few objectives of Common Core. Set a yardstick to compare education performance across countries. Much of the Common Core was developed by countries with the best education programs in the world (Singapore, Canada, Finland, and U.K.); it is accepted with developed countries, so test results can be compiled in ‘global rankings’. Likewise, set a yardstick to compare the education performance on a state and local level. Federal and state governments have test results to make decisions on funding, incentives, and aid to school districts. Obama introduced ‘Race to the Top’, which includes competitive grants based on educational performance – a carrot for states to adopt Common Core standards. Make teachers accountable by linking their performance to results. This is a major reason why most states have adopted the Common Core and some states, such as Tennessee and DC, have already seen improvements in test results published this year. Reform education to become more challenging and writing intensive. [i] Education is somewhere in a major transformation due to online learning, social media, and global competitiveness. There is demand for ’emerging transferable skills’ – new age skills based on handling vast amounts of information, adopting new technologies, and utilizing various forms of communication. To prepare, students should have a strong foundation with Common Core. Motivate students to reach measurable goals. Students see the results of the test and how they performed compared to their peers. Like with the SAT, many of them will want to improve their scores. There are already online courses designed to prepare for Common Core. The reception to the Common Core testing has been tepid. In New York, test results dropped 30 percent in a year. [iii] Last week, I heard on the local news about a town meeting (in Upstate NY) where parents and legislatures discussed the results of the Common Core thus far. The majority of parents addressed their concerns of students underperforming and seeing poor test results, and here are some of their points: The wording of questions might be confusing… My child is a poor test taker but gets good grades… My child has great social skills and is creative but is underperforming on the test… Many of the arguments surface with any type of standardized test, moreover, the Common Core is new and meant to be challenging – a way to stimulate our kids. I think we should embrace Common Core and use it as a motivator to improve learning in the classroom. Of course, teachers have the biggest responsibility to effectively incorporate Common Core into their lesson plans. To support their efforts, there should be free, universally accessible online courses and games designed to build skills related to Common Core (similar to MOOCs or badges); there are already Common Core preparatory classes (but they clearly favor families that can afford them). Common Core is a precursor to the CLA+. Common Core tests for aptitude in math, reading, and writing, all of which are necessary to think critically. With the CLA+, students are given articles, data, and an agenda and are expected to write a well composed, persuasive essay. Interestingly both tests are writing intensive and challenging. Common Core works with a Skills-Based Approach by helping students identify core-competencies to plan the building of a skill set. For example, students who score high in mathematics might focus their attention on a STEM related field. Students start developing their skill set utilizing whatever learning channels are available to them in and out of the classroom. [i] Editorial Board. “Advertisement for the Common Core”. NY Times, November 19, 2013. [ii] Rex Tillson. “How to Stop the Drop in American Education.” WSJ, September 5, 2013. [iii] Valerie Strauss. “Arne Duncan: ‘White suburban moms’ upset that Common Core shows their kids aren’t ‘brilliant’.” Washington Post, November 16, 2013. Second, there is learning based on a sequence of courses (and often other learning channels) where a student builds an expertise with skills and acquires domain knowledge. Sometimes the sequence is structured in the form of a degree or certification, sometimes the sequence is freeform based on the specific needs of the professional; the latter is becoming more common because online learning makes self-guided learning more affordable and accessible. It is more efficient and practical to think building skills rather than degrees. 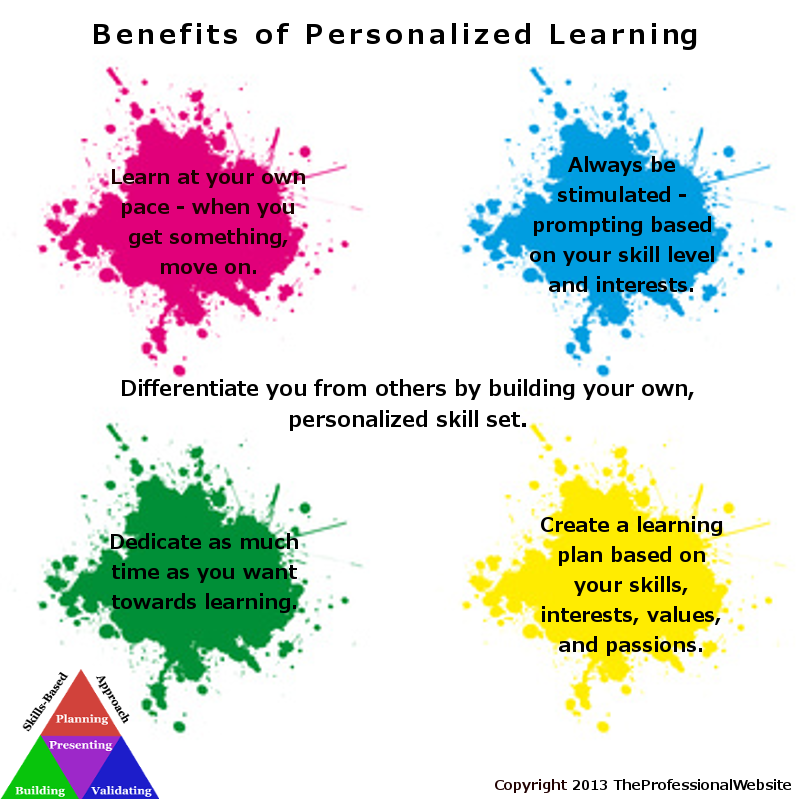 Here are some benefits of having both kinds of personalized learning in higher education. Being able to learn at your own pace is a compelling reason to adopt online learning and having the resources to allow you to dedicate as much time as you want towards learning is powerful. I do not advocate rushing a learning process and I know a lot of learning is sequential; (there are usually pre-requisites when taking advanced courses). However, I believe it is possible to concentrate your efforts where you spend the same amount of time learning but do it faster by dedicating more hours a week. It was shocking to learn full-time students on average spend twenty-seven hours a week towards academics. [ii] In my opinion, the baseline should be at least forty hours a week (a typical work week), and could be as much as sixty to eighty hours a week (which some students spend in business, law, and med graduate programs). (One student spent this upper threshold of time on his coursework and completed an associate degree in 3 months and 5 days.) To conclude, students can accelerate the time it takes to complete course requirements by utilizing online learning. Professionals benefit from continuing education where they keep their skills sharp by staying abreast of new technologies, applications, and/or methods. Technology and globalization is transforming the typical work environment, so it is logical for professionals to utilize online learning to understand where the landscape is moving. For example, say you manage a web hosting company, you better have a deep understanding of cloud computing so you can respond to customers who ask you about it. Cloud computing is sophisticated enough where reading a few articles is not sufficient learning. There are a lot of ways personalized learning works with a Skills-Based Approach. First and foremost, the central premise of a Skills-Based Approach is developing a skill set throughout a career. You create a plan to build required skills using all available learning channels and, in this way, it becomes extremely personalized. Second, a competency model of learning fits with the building and validating stages of a Skills-Based Approach where you assess the progress of building skills and later find ways to validate them. (So the time it takes to get a degree and the accumulation of credit hours becomes irrelevant.) Third, with personalized learning you present your skills and knowledge as you learn them. There are various ways to present a skill, which makes it easier to express what you have learned. [iii] Anya Kamenetz. “Are You Competent? Prove It.” NY Times, October 29th, 2013. Are Critical Thinking Skills A Benchmark Of Higher Education? I am reading Academically Adrift where Richard Arum and Josipa Roska conduct a longitude study based on the results of CLA test (among other things) and question the value of the first couple of years in a college education. 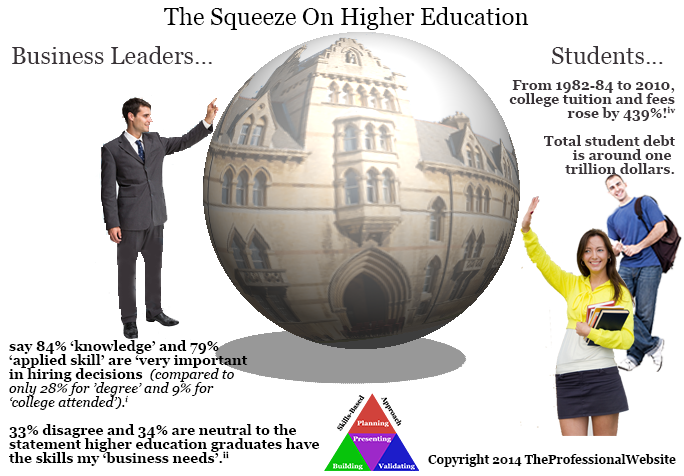 Are students learning essential transferable skills in the first couple of years of college? And this is precisely what colleges are trying to accomplish in the first couple of years! Students take a combination of writing, math, and humanities courses to improve related transferable skills. Some blame higher education institutions saying teachers cater to the whims of their students by treating them as consumers (which leads to inflating grades, etc.). But I think the problem hinges on the willingness of students to spend time learning and not just trying to get a grade. For example, I never understood why someone cheats on a test or copies the contents of a paper; I am not necessarily coming solely from a ‘purist’ point of view, but sabotaging an opportunity to learn seems senseless to me. Is what students learn during the first two years of a traditional bachelor’s degree worth the cost of tuition? For the majority of students, probably not. Too many are concentrating on a social experience and do not dedicate enough time to learning. Full-time students on average spend merely twenty-seven hours a week towards academic activities. [iii] This is far less than the typical forty hour work week of a professional. I am not discrediting the value of a social experience because I think it is important to build lifelong friends, learn to be assertive among peers, and assimilate with a diverse student body. However, I do not think colleges should be run like a country club. In my opinion, the problem rests with the maturity of students rather than higher education per se. I would like to see students having the same dedication towards undergraduate programs as they do with graduate programs. I attended a MBA program where every student had almost perfect attendance, completed their homework, and participated in discussions. It was like a full-time job where we all worked very hard and the social experience was amazing too. Perhaps there is a way to instill self-guided (as opposed to parent-guided) diligence in high school, so incoming college students are ready to learn. In Academically Adrift, the authors call this academic preparedness and make the conclusion that it has a strong relationship with CLA growth – students who are more academically prepared, have a bigger increase with their performance on the CLA after two years of college. Are there cost-effective ways to learn these transferable skills? Parents are allowed to homeschool their children. Once they pass a test to demonstrate competency, they get a high school degree. Similarly, let students complete a collection of MOOCs and then take the CLA+. Once they score high enough, give them a credential that they are academically prepared. Community colleges offer general education courses and charge far less per credit hour. Spending a year or two at a community college is a smart decision for someone who needs to get their academic bearings straight. Are there ways to prepare for the CLA+? There are collectively thousands of courses offered by the MOOC consortiums. Courses in journalism, math, statistics, humanities, social science, psychology, finance, politics, history, and science all build critical thinking skills. I bet there will be preparatory courses for the CLA+ soon (akin to SAT prep courses). Like any standardized test score, if you do well, it is a valuable credential. You can share the results of the CLA+ with employers. Think of the benefit in telling a potential employer, “I scored in the top 25 percentile of all college students on a standardized test for critical thinking.” You are telling an employer that you have a strong foundation to build whatever technical skills they throw at you. In terms of taking the test, it is currently only available to students at higher education institutions and through StraighterLine. So if you take a series of MOOCs and then take the CLA+ through StraighterLine, you can skip the equivalent of two years of college all for the cost of taking the CLA+: $79. [ii] Richard Arum and Josipa Roksa. Academically Adrift: Limited Learning on College Campuses, (Chicago: The University of Chicago Press, 2011). Author TheProfessionalWebsitePosted on November 13, 2013 November 14, 2013 Categories Education, Skills Based ApproachTags CLA, higher education, standardized test, transferable skills1 Comment on Are Critical Thinking Skills A Benchmark Of Higher Education? 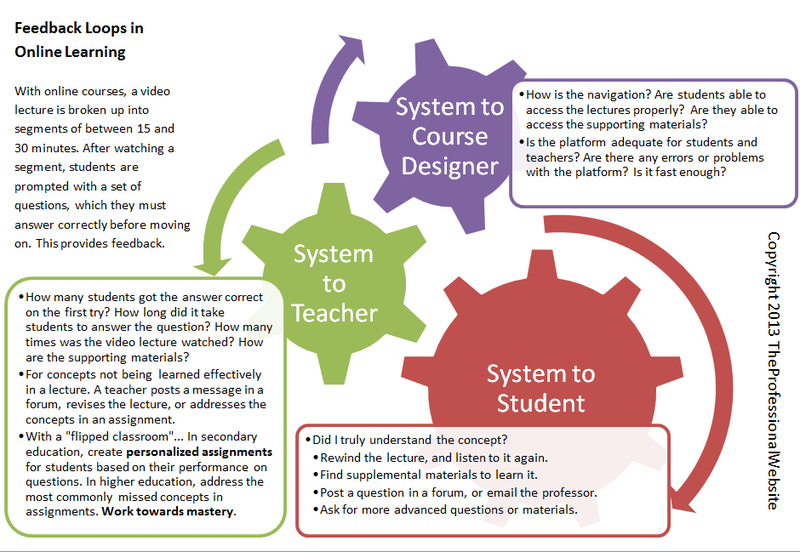 One compelling reason to move towards online learning is it introduces three feedback loops: learning platform to student, learning platform to teacher, and learning platform to course designer. Utilizing feedback from online learning platforms has the potential to revolutionize the learning experience in all stages of education. In primary and secondary education, it helps teachers move towards personalized learning plans and mastery where students learn at their own pace. Especially in secondary education when teachers utilize flipping – students watch an online lecture and then come to the classroom for coursework and testing. Daily feedback on a lecture is more powerful than periodic feedback from assignments. In higher education, feedback loops inform: students whether they really understand a concept so they can seek out other ways to learn it, teachers how effective their lectures are so they can modify them and provide supplemental support, and course designers how to improve the structure of the course. There are also advantages in flipping in higher education, by maintaining personal interaction between student and teacher and providing an opportunity to address poor retention of concepts from the lecture. Finally, the feedback provides empirical evidence to evaluate a teacher’s effectiveness (which is an improvement to the student evaluations taken at the end of a course). Feedback loops strike me as a big reason to adopt online learning platforms. Understanding students’ retention on what they are being taught, and having the ability to respond to it (sometimes immediately) should improve the learning experience. In addition, it frees teachers to concentrate on delivering the best possible lecture. William G. Bowen, Higher Education in the Digital Age (Princeton: Princeton University Press, 2013). Tina Rosenberg, “In Flipped Classrooms, A Method for Mastery,” New York Times. October 23, 2013.